Library instruction sessions take precedent when scheduling. Requests must be made one week in advance. Immediately examine the room upon arrival for any damage to the facilities or equipment; your department will be responsible for any repairs or missing equipment. Please turn out the lights, lock the doors, and return the classroom key to the West Circulation desk after use. Policies subject to change. Questions: liblab@olemiss.edu. 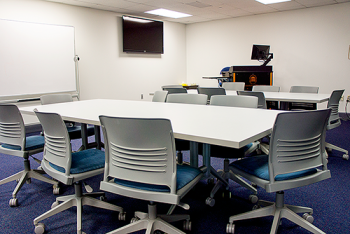 This classroom, adjacent to 106-E on the library’s 1st floor, seats 40 students. There are movable tables and chairs and 3 large wall monitor screens linked to the instructor podium. This is an excellent room to use for students to make class presentations. 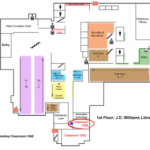 Bring your faculty/staff ID and confirmation of your reservation to the main circulation desk on the first floor to check out the room key after 5 p.m. Directions: Enter the J.D. Williams Library from the West (fountain) side or come down the stairs if you enter from the second floor. Go into the Information Commons and turn away from the Reference Desk. 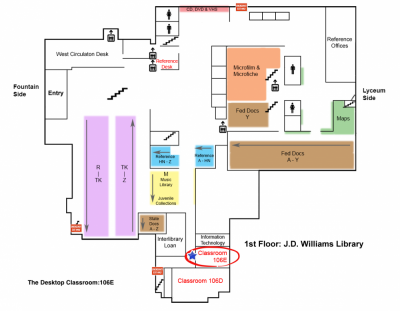 Library Classroom 106D is at the far end of the hall on your right. 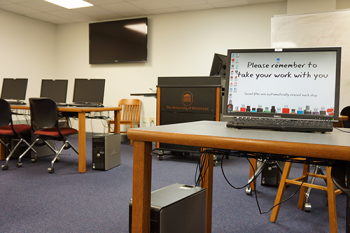 This classroom is a 24-seat desktop lab with 24 computers, located on the library’s first floor. There are two large wall monitor screens linked to the instructor podium. Information on printing and programs available on public computers may be found in more detail on the web page “Computing in the Library.” The library will not install any additional software; outside software is automatically deleted within 24 hours. 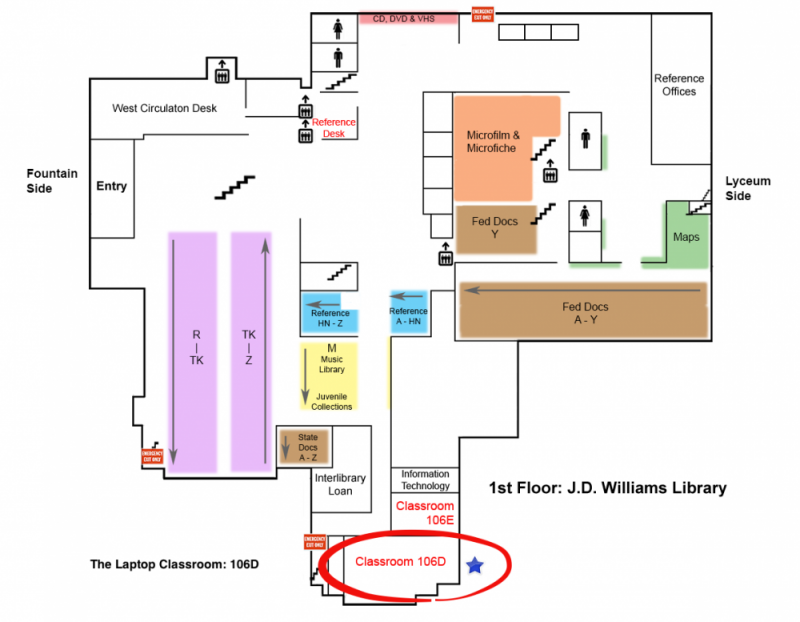 Bring your faculty/staff ID and confirmation of your reservation to the main circulation desk on the first floor to check out the room key after 5 p.m.
See more information about Classroom 106 E.